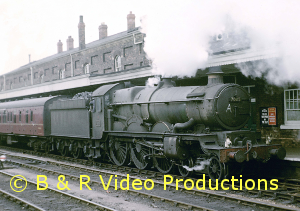 The second part in our series featuring scenes of the former Great Western Railway using archive film from the 1920s all the way to the diesel hydraulic era in the 1960s. In this part we mostly feature the freight and mixed-traffic classes, from the large 2-8-0 class 42xx and 72xx 2-8-2 tank engines used in Wales, through to the Prairie 2-6-2T and the Pannier 0-6-0Ts which were unique to the GWR, including the condensing varieties and the last 84xx series, on both passenger and freight trains. The tender classes are covered in more depth than in our first volume, ranging from the heavy freight 2-8-0s to the mixed-traffic 4-6-0 Hall classes. We also feature the 43xx 2-6-0s and the 2251 class 0-6-0s. 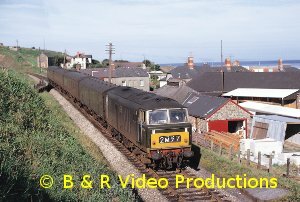 The GWR also ran extensive maritime services and we show footage of the Fishguard and Weymouth operations. There are scenes of steam all over the GWR network with normal service trains and special rail tours. 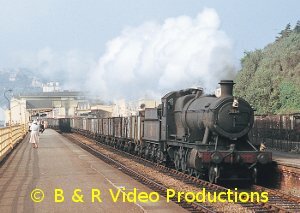 We conclude with footage of the first locomotive to exceed 100mph, 4-4-0 No.3440 “City of Truro”, newly restored and running on preserved lines plus the replica broad gauge engines at Didcot Railway Centre. Apart from a few scenes, filmed in the 1930s and 1940s, all the material is in colour and the film has an extensively researched commentary with an authentic sound track. Cover photo: Keith Pirt/Courtesy Booklaw Publications, Heavy freight 2-8-0 No.3834 at Dawlish, July 1957. 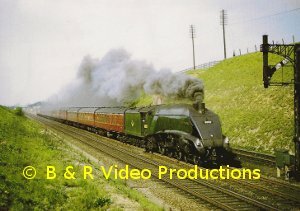 The fourth in our series of films on the East Coast Main Line in the 1960s. There is much steam coverage but this is also a story of the transition from the steam age to the diesel age when Deltics came into service followed by the HSTs. 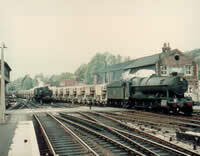 We start with the Great Northern section and Kings Cross where there are many scenes of steam traction before it mostly finished south of Peterborough in 1963. All pacific classes are seen as well as V2 and B1 classes and occasional specials including one with a GWR Castle. We travel north through Finsbury Park, Harringay, Hornsey and through Hitchin to Peterborough. Onwards and further north to Doncaster, Langwith and Frodingham & Scunthorpe, for scenes of many of the ex-LNER freight types. Now onto the former North Eastern Region with visits to Leeds, Wakefield and Bradford before returning to the East Coast line for Otterington (Northallerton). We arrive at Newcastle for the demise of North Eastern steam. Tours around this area include the Stanhope branch with K4 3442 “The Great Marquess” and some scenes of the Alnwick branch in Northumberland. The film has excellent detail with an authentic sound track and a highly researched and informative commentary. Locations are mostly filmed in colour but there is some black and white footage from 1962 and 1963. Green and blue Deltics are included and even a Western Region hydraulic on it’s one tour. There are also a few Type 2 diesels! The third volume in the series takes us from South Wales to Penzance with an introduction at Paddington. Cardiff and Newport scenes in 1965 when there was still steam hauled freight by both large and small tank engines. Freight with steam is also seen climbing Pilning Bank out of the Severn Tunnel including the car ferry train. Down to Bristol on Stapleton Road bank. Another visit to the Staple Hill Bank on the old Midland,· but by now under Western Region control. While at Bristol see 4079 being loaded onto a ship for Australia. We thought it would never come back, but it did. Westwards via Taunton, Exeter and the sea wall to Plymouth. Cornwall and its branches to Penzance. This has a mixture of steam and diesel-hydraulic power. All scenes unrepeatable!